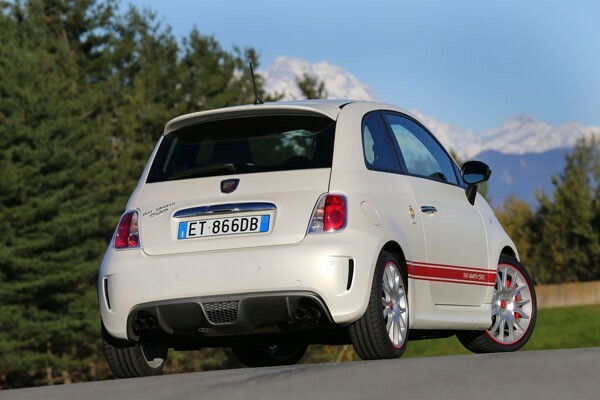 ABARTH 595 GETS ‘FERRARI’ ENGINE! The old and the new, an excellent shot of the latest Abarth 595 meeting its hot ancestor from 1963. Abarth, the high-performance division of Fiat, has produced a limited edition version of its hot Abarth 595 and the really big news is the installation of a Ferrari engine! Well, it’s not a Ferrari engines as in the megabuck supercar, but the one from the Abarth 695 Tributo Ferrari. 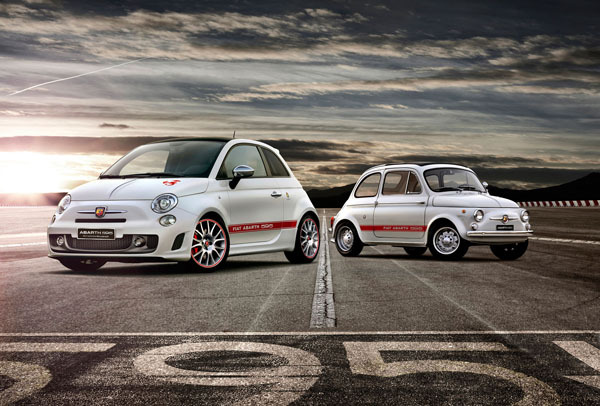 The Abarth 595 ‘50th Anniversary’ celebrates the introduction of the original Fiat 500 Abarth 595 in 1963. Following on Fiat Australia’s sellout success with the limited edition Fiat 500 by Gucci, the company’s Australia chief, Veronica Johns, says she is proud to have scored 50 of the Abarth 595 ‘50th Anniversary’ for Australia. Ultra-trendy Gucci and ultra-sporting Ferrari are obviously very different brands, but both are iconic Italians. You have to give Abarth’s marketing guys and gals top marks for coming up with special editions based on too dissimilar, but highly desirable, products. Power for the 50th Anniversary comes from a turbocharged 1.4-litre engine. In the standard Abarth it develops 118 kW, in the Abarth 595 Anniversary this has been increased to 132 kW. There’s up to 250 Nm of torque thanks to an overboost function activated by pressing the Sport button. This puts the ECU into a full-on sports map and increases turbo boost. 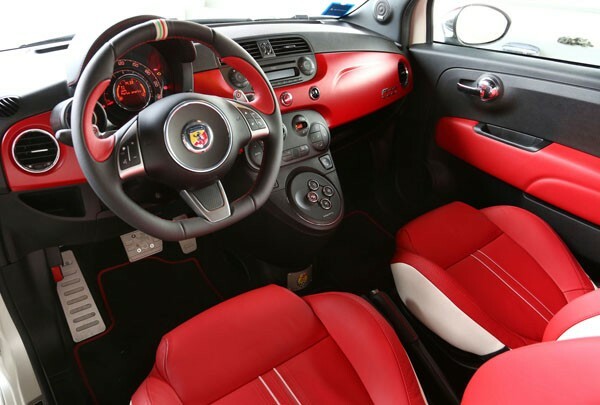 Sadly the Abarth 595 is only offered with an automated manual gearbox. Though it has been given the grand title of ‘Abarth Competizione’ it’s still a fairly primitive unit. While it does have steering wheel paddles for pseudo-manual control, we would much rather have a proper manual gearbox. Should you be in the Northern Territory you will find this little italian hotshot has a top speed of 225 km/h. In the rest of Australia you will have to settle for sprinting from zero to 100km/h in under seven seconds, or take it for a trip to a racetrack. Driving dynamics can be adjusted by Fiat’s DualDrive electric power steering with ‘Sport’ function. Even better, the TTC (Torque Transfer Control) system juggles the amount of grunt sent to each of the front wheels to maximise driver control and enjoyment. Best of all, the engineers at Abarth have designed what they call ‘Record Monza’. This system is named after the famous Italian racing circuit and uses a variable-back-pressure, dual-mode exhaust that delivers an inspiring sound from the hot Abarth when you get the engine where it belongs – over 3000rpm. I just can’t wait to get behind the wheel of one … it can sit beside my wife Julie’s Fiat 500 by Gucci in our garage and they can discuss all things Italian. The hottest Abarth ever has17-inch alloy wheels in 695 Magnesio Grey embellished by a red liner. Three-layer white paintwork, is an excellent contemporary reinterpretation of the 1963 Abarth. It is embellished with graphics that look spot on. Abarth 595 ‘50th Anniversary’ has foglights, Xenon headlights and a fold-back sunroof, the latter just like the original. Inside are red leather sports seats with white inserts and red stitching. A historical logo adorns the steering wheel that’s finished in black leather with red inserts. This logo is also used on the door kick plates. Standard gear includes climate-control air conditioning with pollen filter; CD/MP3 radio with controls on the steering wheel; an Interscope Hi-Fi system; and the Blue&Me voice control system developed in conjunction with Microsoft. On the accessory list there’s some good stuff: a ‘595’ vintage car cover, special edition sunglasses and even ‘595 Anniversario’ dedicated Tramontaro luggage. The Abarth 595 50th Anniversary special edition has a suggested retail price of $45,000. Not cheap, but you get a lot of sporting Italian automotive heritage for your money and, who knows, it may even become a collectors’ car on day.